schuberth src para s2. Casque moto pas cher! Communicate, make phone calls, navigate, listen to music -everything under one helmet! Conference call with up to three riders, who can communicate with each other at the same time. The range is, under optimal conditions, up to 700 metres. The SRC-System™ for the S1 can be operated comfortably via voice control. Click-to-Link®: If other SRC-System™ users are close by, these can be addressed. Should the distance be greater or the terrain more demanding, communication is bridged by mobile reception. Thus, communication is not broken even when the distance is greater. The connection between Bluetooth enabled mobile, Bluetooth enabled navigation system and SRC-System™ is as easy as can be. 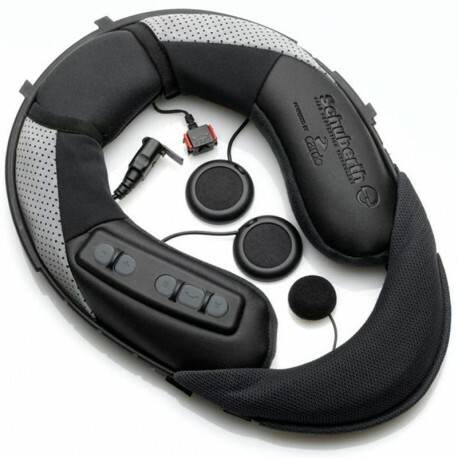 The driver can hear the voice commands of the navigation system or the caller comfortably through both head phones. Telephone conference between rider, pillion and caller are possible. The preferred phone numbers can be saved in a quick dial menu. This makes it possible to have quick contacts at any time. All functions can be comfortable controlled through voice commands (VOX). The automatic volume control (AGC) technology controls actively and permanently the optimal volume according to speed and environment noise and therefore actively benefits your safety while driving. The sensitivity can be individually adjusted using the supplied software.